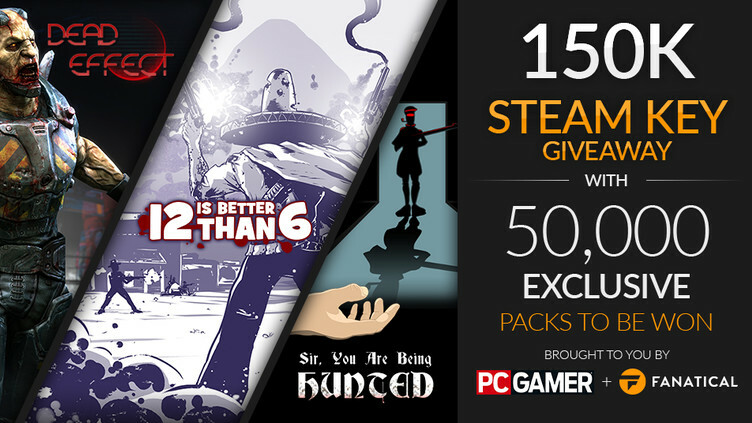 Fanatical is giving you the chance to win one of 50,000 triple Steam key bundles to celebrate the launch of the new site. Sir, You Are Being Hunted – A stealth and survival game unlike any other, players will have to scavenge for food and weapons in their fight against tweed-wearing robots. Dead Effect – First-person action shooter Dead Effect which sees you hunt down hordes of zombies aboard a spaceship, using an array of tasty weapons to turn the undead into mushy piles of guts. 12 is Better Than 6 – Help an escaped Mexican prisoner fight for his freedom in this bird’s-eye view, gun-slinging indie game – using a range of western themed weapons or the element of stealth to defeat your enemies as you travel from Mexico to Texas. To enter this giveaway, head over to Fanatical (ex- Bundle Stars) and follow the instructions on the widget! Good luck!